The Warrington Museum of Freemasonry contains an extensive range of books, pamphlets and papers. Please click the button below to download a copy of the Catalogue. Any of the books listed can be examined or read within the Museum itself, but the permission of the Curator mjust be obtained before any book can be removed from the Museum premises for any purposes including loan. Please use either the telephone number or the email facility on the ‘Contact Us’ page to contact the Curator. 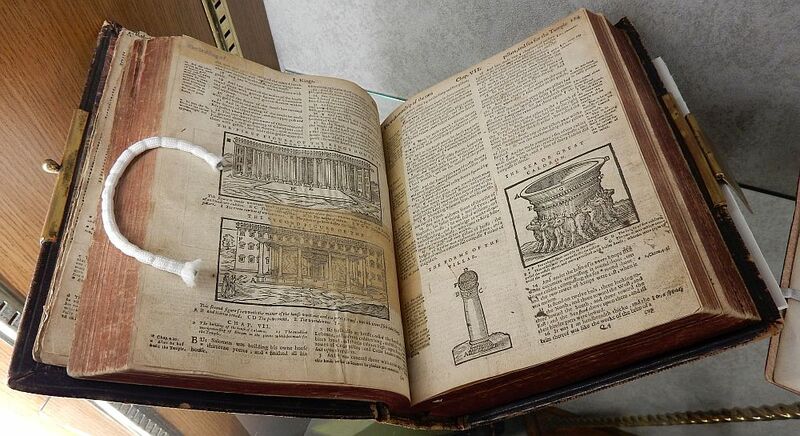 This 1599 edition of the Geneva Bible is in the care of the Lodge of Lights No 148. It has bee rebound, probably in the late 19th Century and printed prior to 1630, probably in Holland. 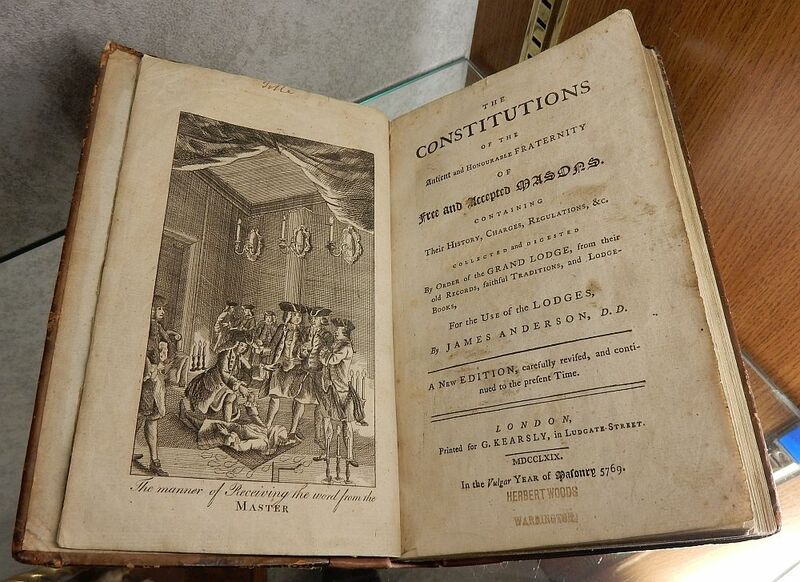 Book of Constitutions (1769). A rare illustrated copy. 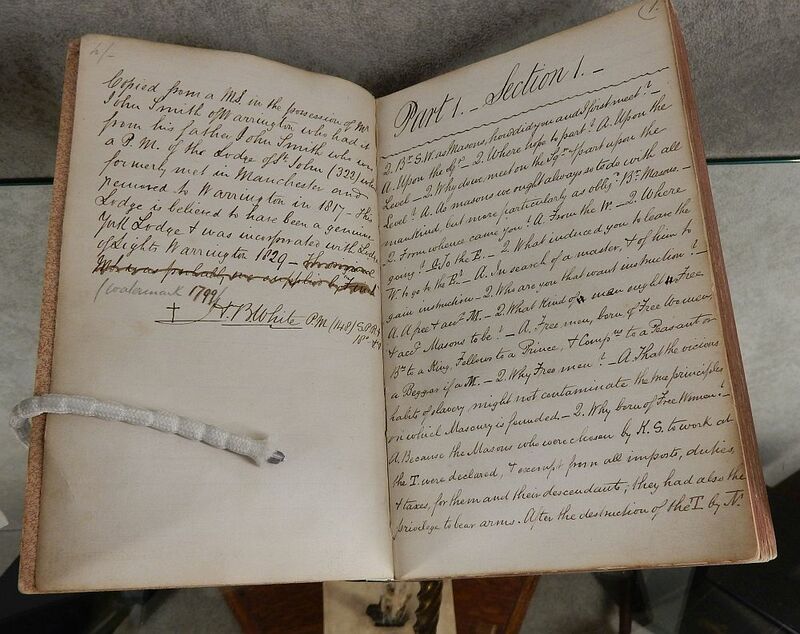 “copied from a manuscript in the possession of Mr John Smith of Warrington, who had it from his father, John Smith who was PM of the Lodge of St John (322) which formerly met in Manchester and removed to Warrington in 1817. This Lodge is believed to have been a genuine York Lodge and was incorporated with the Lodge of Lights Warrington in 1829. The original manuscript was probably supplied by Finch, the water mark on the original copy was dated 1799. Confirmed by Lionel Vibert Secretary Quator Coronati Lodge 1935.